You’ve been sucked into a wormhole into the future where the 5 reels rely on neon powered energy and electro music to fuel their constant spins. Spin the reels on this colourful online slot and match up pink neon jaguars, turquoise pythons, and golden lions to win some huge rewards in this Wil.I.Am inspired slot. Better gaming begins right here, with one of the world leading providers of premium gaming solutions. NetEnt have managed to build a video slot empire, with periodical uploads to a global market place, each of their now 200 instalment holds its own in this incredibly competitive field. Since this developer’s conception over 20 years ago they have been continuously pushing the boundaries on what a video slot can be, introducing a plethora of gaming experiences with one common thread - style with substance. 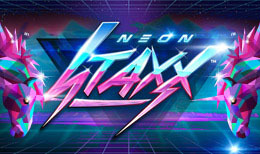 A neon-future with a space age vibe, Neon Staxx simplifies the world into a range of vibrant colours. Bask in the shadows of the skyscrapers against the neon pink and neon blue – but remain vigilant as in this world not all is as it seems. With the change of environment comes a change in genetic structure, watch out for the genetically altered lions, birds, tigers and snakes – but do not fear, they are the key to unlocking the treasures of Neon Staxx. With a plethora of prizes to be won from this world players should look out for Wild and Scatter symbols during each round. The Wild symbol is represented simply by the word Wild in a bright pink font, this will act in place of any other none-bonus symbol to award players with a winning payline. Within Neon Staxx Wilds also contain a secondary use, instant wins can be awarded for multiple symbols appearing on a single payline, 3 symbols will award 15 coins, 4 award 30 coins and 5 will award 200 coins. To gain Free Spin Bonuses players need to collect Scatter symbols, Scatters are depicted as pink neon triangles. Collecting 3 will trigger a round of 10x Free Spins, 4 will grant 15x Free Spins and 5 can award 20x Free Spins. The unique bonus within Neon Staxx is randomly triggered. With the chance to win over 1,000 coins Super Staxx will see Stacks of Predator Symbols spin in on the reels to form several winning pay lines – all of which paying out simultaneously from the 20 available paylines. With visuals, like classics such as Tron this alternative reality is easily identifiable. The graphics are bold, combining the 80s colour motifs with futurism and geometric shapes. The play style throughout Neon Staxx is quite simplistic allowing for instant adaptation if playing this style of game for the first time. With multiple chances to win, and a randomly triggered bonus round that can pay up to 1000 coins NetEnt have provided a strong go-to video slot game with this gaze into an alternative and futuristic existence. Another game is waiting for you, Try your luck and play Nrvna The Nxt Xperience.